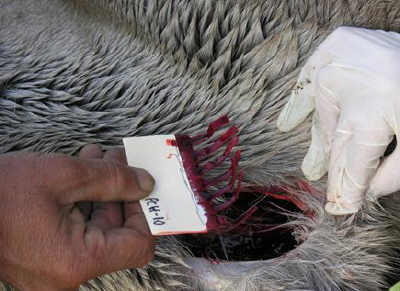 The main goal of this research was to assess the efficacy of filter-paper (FP) blood sampling for detecting pathogen exposure in caribou (Rangifer tarandus ssp.). FP sampling is a practical method that is well-suited to harsh environments and can be done by laypeople. FPs can be collected by hunters, biologists and others in the field, and this initial validation step sets the foundation for future widespread serosurveillance of infectious disease in caribou herds. Throughout International Polar Year (2007-2009), the CARMA network collected FP samples from circumpolar caribou herds for this ultimate purpose. FP samples will also be validated for progesterone (pregnancy) detection in caribou as this tool offers advantages in capture settings and other circumstances. - Progesterone: In March 2009, pairs of FP and serum samples were collected from 3 male reindeer and 7 female reindeer (some bred naturally in fall). Duplicate testing will be done at multiple time points up to 1 year, and with FPs subjected to different collection/storage regimes (freezing, room temp). 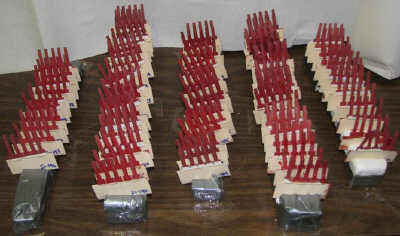 Collection of blood on filter paper from the jugular vein of a hunter-killed caribou. Pathogens: For all eight pathogens initially investigated, serological testing (detection of antibodies in serum vs. filter paper [FP] samples) was done in duplicate at diagnostic laboratories. Serum and FP data were generated from competitive enzyme-linked immunoassay (c-ELISA) for Brucella, West Nile virus, Neospora caninum; from indirect-ELISA for Brucella, bovine herpesvirus-1, parainfluenza-3 virus, bovine respiratory syncytial virus; and from virus neutralization for bovine viral diarrhea virus types I and II. Quantities of data vary by pathogen. Initial analyses indicate that FP testing is valid (high sensitivity and specificity when FP is compared to serum as the gold standard) for the pathogens and tests noted. Testing continues in order to assess multiple time points (up to a year or longer of storage) and acquire larger sample sizes for some pathogens. A pilot study of collection/storage regimes suggests minimal difference between FP results after frozen storage vs dry storage. A more robust investigation of this is planned. Progesterone: Initial results indicate that progesterone levels detected from Rangifer FPs are different from (higher than) the levels detected in matched serum samples; however, the difference is consistent. Sample size is small and testing is ongoing but results are promising. It appears reasonable that Rangifer-specific cut-offs could be established to identify animals as "pregnant - yes/no." Once validated, filter-paper blood samples collected during International Polar Year and beyond will be used to establish baseline disease "profiles" for circumpolar caribou herds. The filter paper tool will permit widespread serosurveillance of infectious disease in caribou herds by biologists and communities (hunters) across northern regions. Validation for progesterone (pregnancy) detection will meet several needs of caribou biologists/researchers in capture settings and other situations, and could help provide valuable herd-health information.